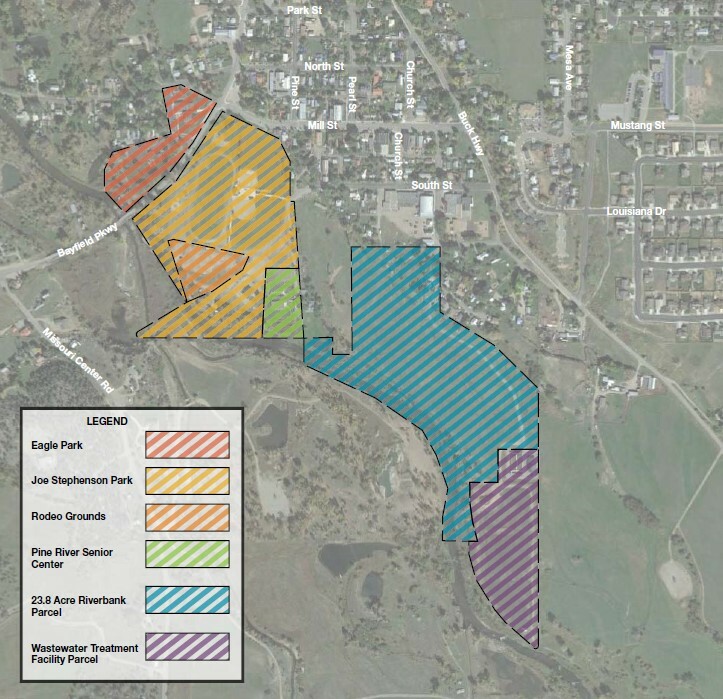 Following up on the recently adopted Town of Bayfield Parks, Open Space, Trails, and Recreation Plan, the Town has hired a consultant, Groundwork Studio, to further develop a conceptual design for Eagle Park, Joe Stephenson Park/Sports Complex, the Pine River Senior Center, the 23.8-acre River Bank parcel, and the Wastewater Treatment Facility property. This project included cultural and environmental evaluation and permitting, GIS data collection, stakeholder interviews, and a public visioning workshops. The information served to inform up to three conceptual designs. The three designs were then presented to the Town and the public to elicit feedback. Based on the feedback, the designs were refined into a final conceptual design. The final conceptual design will include recommendations for construction phasing, construction cost estimates, and a summary report. For additional information please contact the Parks and Recreation Director Becky Eisenbraun at (970) 884-9544 or by e-mail at beisenbraun@bayfieldgov.org.